As you can see I have added a step in between of the regular login flow. This way the user is never asked for a new password, but the password is 'silently' upgraded to a new hash. So how can we easily intercept the regular login flow when using Laravel's built-in Auth classes? Let's dig in. You can also directly embed these details into the class we're going to make, however I'd recommend using configuration files for these kinds of things: they greatly improve maintainability. Now that we have set up these configurations, let's put them to use. We are going to make a dedicated class that checks if we are dealing with a legacy password, and if so, upgrade them. I would advice against putting this in your controller; your controller should not know about this kind of logic! For the purpose of this post I will be using a namespace called Acme, but you can change this to your own preferred namespace. This namespace will be placed in the app/src/Acme/ directory. For the user model we will be using the User model that is provided with every new Laravel installation. To start, let's create a Services folder where we can place our password upgrader class. In this directory, create a new file called PasswordUpgrader.php. Now that we have created an empty class, let's first go over the requirements a bit. What do we want this class to do and which dependencies do these actions require? The class must be able to check if we are dealing with a legacy hashed password. The class must be able to hash a plain password using the legacy configurations we just created. The class must be able to rehash the password using the new hashing method. The class must be able to update the password on the user model. Now we are ready to implement the actual functionality of this class. First, let's set up the first version of our functionality. After that, we are going to refactor and clean up the code. // First, let's grab our legacy hashing configurations. // Next, let's hash the plain password using the legacy method. 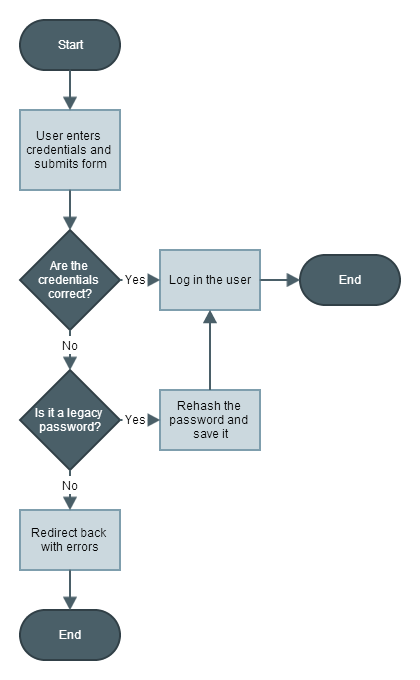 // Check if we are dealing with a legacy hashed password. // and save it on the user model. // let's leave it here for the purpose of this post. // and the password was updated. // credentials, so let's return false. All this extracting might seem a bit overkill, but I think it makes the class that much more understandable, as each method clearly describes what is happening in the process. To finish up, let's take a look at what happened to our checkLegacyPassword method after the refactor! There we have it, clean and readable! But how do we integrate this into our login flow? Let's deal with that now. As you can see I have also included a use for the UserInterface. This is necessary because we will be using the getAuthPassword on the User model and we need to make sure that this exists. The UserInterface requires this method to be implemented. Looking at the original class provided by Laravel we can determine that we are interested in overriding the validateCredentials method. This is the method that checks the input password against the hashed password in the database. Before we start implementing this, let's look back at the flow chart real quick to see how we want to implement this method. Looking at this chart, we can define the following steps for our method. Check the input password against the hashed password in the database. If this password is correct, return true. If this password is incorrect, return the result from the checkLegacyPassword from the PasswordUpgrader class. // get the hashed password from the user model. // the Hasher and Config classes into it. // PasswordUpgrader from the container. // Instantiate our own UserProvider class. // UserProvider class into its constructor. As you can see I have called the Auth driver legacy. However, you can name this anything you want. To finish up, let's register our service provider and the new Auth driver with Laravel so that we can use it in our code! And that's it. Now whenever you use the Auth::attempt() method from your controller, if that user has a legacy hashed password, it will be automatically updated!